After taking a well-deserved break from their royal duties, Prince Harry and Meghan Markle are back in full force. The Duke and Duchess of Sussex, who were reportedly vacationing with the Queen in Scotland and later in Lake Como, Italy with George and Amal Clooney, attended a few events over the last week and it gave royal-watchers a chance to learn more about them. 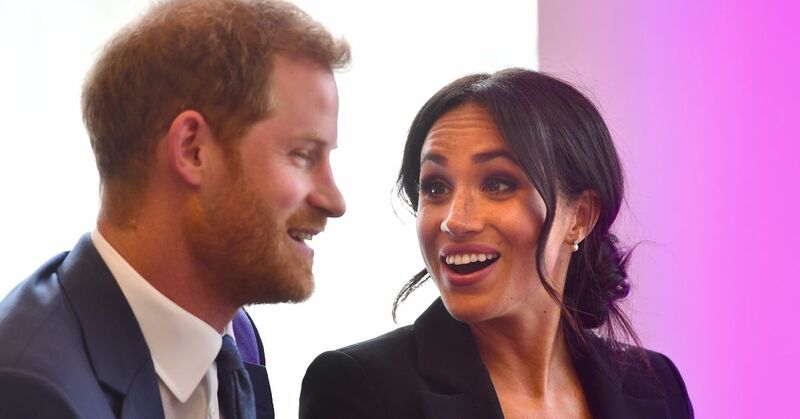 On August 29, the newlyweds enjoyed a very pubic date night as the guests of honor at the West End performance of the hit musical Hamilton to raise funds for one of Harry's charities Sentebale. While many people were focused on Meghan's daring Judith & Charles tuxedo dress, some people caught a sweet detail about the private couple. As they were getting ready to pose with the cast, Meghan accidentally let her cute nickname for her husband slip. In a clip posted on Instagram, the Duchess can be heard asking, "Can you see, my love?" Meghan didn't realize right away, but when she did, she let out a tiny gasp and giggled in embarrassment. A few nights later, the couple attended the annual awards night for another one of Harry's charities, WellChild. The pair had the opportunity to meet with the children that the charity has helped, and one of them had a very important question to ask the couple. “There’s a question I have to ask you,” 10-year-old Chloe Henderson told Meghan and Harry. "What’s your favorite Disney film?" Without hesitation, both Harry and Meghan revealed their favorites and they're classics. The Duke fittingly said he enjoyed The Lion King while his wife admitted that she "always loved The Little Mermaid." Harry also shared a tidbit about the film with Chloe, asking if she knew "who does the voice of Zazu?" Revealing that it's "Rowan Atkinson, who plays Mr. Bean." He then added that he also liked some of the more recent animated films like Zootopia and Moana. He even shared that his favorite part of the latter film is "when the chicken [Heihei] comes up and finds himself out at sea in a boat." Meghan chimed in and admitted that they also like the DreamWorks film Leap!, which was released in 2016. Chloe then added, "Harry likes it because she [the main character] has got red hair." Harry and Meghan aren't the only royals who enjoy Disney flicks. Last year, while making an appearance at London's Paddington train station, Prince William shared which film Prince George likes to watch. “He quite likes The Lion King, we’ve watched that a few times,” William told the curious boy. It's adorable that Harry, Meghan and George have their shared love of the Disney film to bond over. What's your favorite Disney film?